Leaders who try to go it alone seldom accomplish much. Only until they build productive relationships with the people they lead can they begin to tap into the true potential of the group. But what does it take to build those relationships at work? 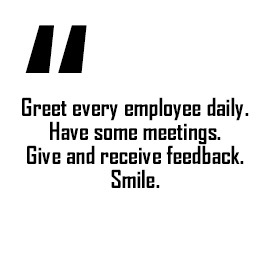 That’s what we set out to learn as we collected hundreds of thoughts from leaders, managers, supervisors and key employees over a 3-year period. We asked the question “What’s the One Thing a Leader Should Do to Build Relationships at Work?” Based on our phrasing of the question, respondents identified the most important “actions” a leader can take. Communication clearly emerged as the number one priority. How strong that communication is depends if it goes beyond the work product itself  and is significantly impacted by a leader’s ability to get to know his/her employees  professionally and personally. Interactions result in understanding, which strengthens relationships, and creates unity and commitment. A surprising subtheme of the research pointed to the leader’s influence in making a work environment that supports a culture of engagement with one another  sharing information, and collaborating. Leaders are expected to set a good example by being interested, available, and involved with their people. J e r r y S t r o m & C o . , I n c .
A leader’s actions are judged at the same time their spoken, written, and non-verbal communications are interpreted. They must all reinforce one another, as mixed messages between what leaders say and what they do create cynicism and demotivate workers. The extent of a leader’s communication can be evaluated on a number of levels: 1) what’s communicated; 2) who gets the communication; 3) how often communication happens; 4) how information is presented; 5) why it’s important; 6) how the communication is received, circulated, and discussed within the organization. A leader is responsible for keeping the lines of communication open (not the other way around). While giving directions or passing along information is only a part of a leader’s job to communicate. Above and beyond knowing their workers’ strengths, weaknesses, and technical abilities, leaders need to connect with people on a personal level  spending time with them and showing interest in their lives. This involves gathering individual insights  what they think, enjoy, appreciate. What’s shaped their opinions and made them who they are? Leaders who actively listen learn about the personalities that factor heavily in the work product, decisions, and achievements. Employees want to know that the leader cares as much as they want to know about what’s going on in the organization. The bottom line is to get to know people as well as you know the work. Leaders benefit from gathering ideas when seeking inputs from subordinates, peers and superiors. Careful listening provides critical insights and feedback. It illuminates how things are going, how they should be going, and what can be done. Relationships are much stronger when people are informed and feel they are being heard. Leaders need to do more than just communicate  they need to “be communicative.” In other words, they must go to great lengths to show regular exchanges of information are valued, and expected. This has a demonstrable impact on the working culture, where open dialogue pays important dividends. Leaders should do it to lead it. 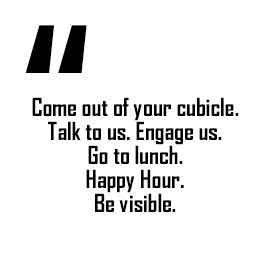 Being present also makes a big difference: checking in with people often; greeting them first thing; connecting via phone, email, texts; stepping into their offices; recognizing them in the hallways and acknowledging them in meetings; sharing lunch, or coffee; having an open door and being willing to take time for conversation; giving one-on-one time. When leaders do the interpersonal work their teams will be stronger at the end of the day. 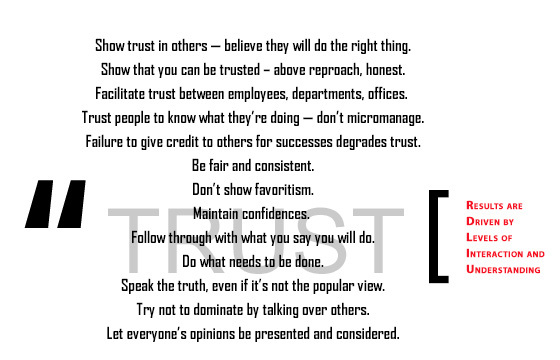 Trust levels are determined by what people experience at work. The cumulative effect of a leader’s interpersonal skills  done in a positive and acceptable manner  will be higher levels of trust in them individually, as well as in the organization itself. “People will be skeptical of your capabilities until they have enough experience with you to be assured you’ll represent their best interests, and will serve as an advocate for their needs.” Once your co-workers, and subordinates gain trust, you’ll be more fruitful in achieving the mission. It’s incumbent on the leader to build extensive bridges of interaction and understanding  supporting a whole ecosystem of trust  where “everyone is in the habit of maintaining and renewing their relationships with everybody else.” It begins with communication which will serve them well. 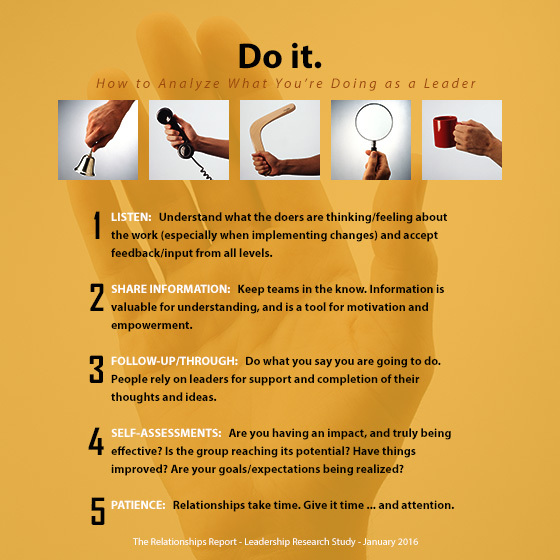 'The Relationships Leadership Research Report’ was compiled from qualitative information collected through written surveys submitted by 566 respondents. The study covered a period between September 2012 and July 2015. Participants in the study included senior leaders, managers, supervisors and key employees representing many different organizations across the continental U.S., and Hawaii. We surveyed a broad, ethnically diverse group; varying widely in their levels of career experience, and job types. Sign up for 'The Leadership Story,' free monthly articles on leadership. © 2016 Jerry Strom & Co., Inc.